The first few courses were stellar. The custard was made with eggs from Anne Quatrano’s Summerland Farm outside of Atlanta and was just a precious taste of a wonderful mix of briny flavors, soft textures and paired with my favorite wine of the night – the Gessamie Gramona 2005 – we bought a bottle to take home from Star Provisions next door. Then, for me, came the house-cured rainbow trout. Owing to Amy’s delicate condition, the kitchen prepared a lovely salad with wonderful shavings of parmesan. She loved the salad, and I loved the sushi-like quality of the trout with the contrast of the radish and artichoke. And the sancerre was amazing as well. The gnocchi, which I forgot to photograph, were amazing as well. The small shavings of summer truffle were incredible, as were my favorite fungi – fresh roasted morel mushrooms. Yum! Pair that with a white burgundy and I was a very happy fellow. The halibut was another of my faves. The succotash of favas, pole beans and tomatoes was stunning, and the touch of gray sea salt they hit the dish with before it came to the table moved it from simple to spectacular. I love the way a great kitchen gets that perfect sear on a piece of fish, with the rest remainig snowy, moist and flaky, all surrounded by a simple butter sauce. The Chateauneuf-du-Pape Blanc was a nice bridge to this dish, introducing much bigger flavors of oak, spice and pine before the meats arrived. For the first of the meat courses, we enjoyed a lovely breast of duck with onions, peas and squash. The duck was succulent, again topped by a few grains of grey sea salt. However, we both felt that the butter-based sauce around the entree was too duplicative of the sauce with the halibut. A small thing, but on a menu like this I was suprised by the repetition. 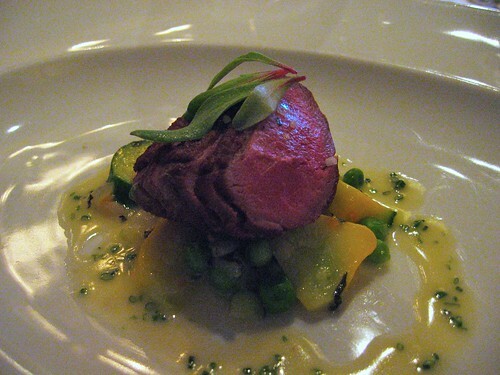 But then came the lamb loin with rainbow chard, japanese turnips and a single perfect baby carrot. Topped by a sprig of fresh tarragon and surrounded by what seemed to be a lamb jus, this dish was wonderful as the meal’s entrees peaked. The Fisher Coach Cab was a great pairing. Although the menu called for a blue for the cheese course, they substitued at our request another cheese, this one a lovely Sweet Grass Dairy ‘Constant Bliss’, which lived up to the name. I would have liked more of a sweet foil for this one, as the single candied pecan was gone too fast! The soup course was a great twist on the palate cleanser. Honeysuckle flower essence coated a trio of fresh melon balls and a trio of fresh melon sorbets, and the flavor took me back to childhood Summer days in my backyard, sucking the nectar off wild honeysuckle vines that grew like weeds for a few weeks of every year. And what would a tasting menu be without dessert? The rhubarb cobbler with blueberry ice cream was stellar – crunchy rhubarb and crumble, intense flavor in the ice cream – just right. And we loved the sweet and sparkling Brachetto D’Acqui. The precious little cupcake with a single candle, and the six pairs of petit fours to end the meal were, as the rest, beautiful glimpses of a very talented chef’s vision and talent. Previous PostTrotz 2.0Next PostCNN.com has a blog!